If you were to ask me what area of my household chores stresses me out the most, I would say “LAUNDRY”. I feel like our laundry takes over my life and my mood! Like most people, we have a small laundry room, which also serves as a mudroom next to our garage. Since I don’t have much room in there, laundry always ends up in our bedroom. Clean clothes, dirty clothes—you name it—ends up either folded or unfolded on our bed. By the end of the day, I usually never get around to putting all of it away, so where does it end up? On the floor! 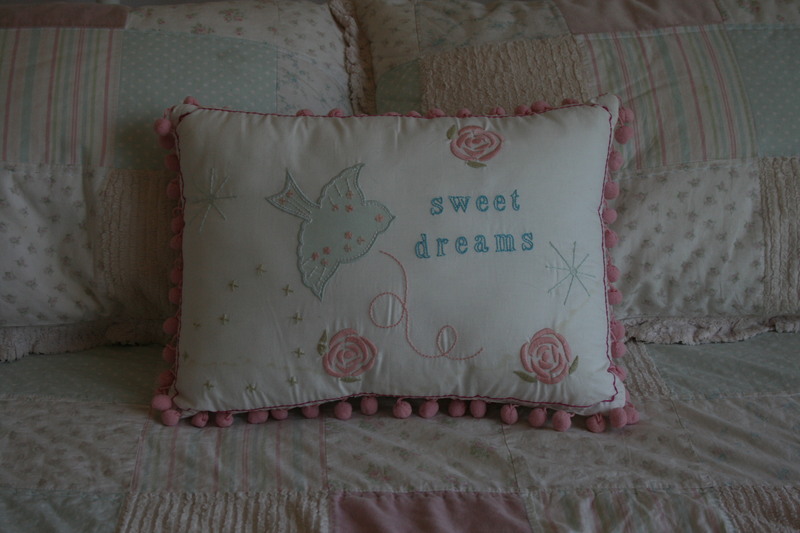 Yep, we are always so tired at night that the easiest thing to do is throw it on a dresser or make a pile on the floor. This makes me CRAZY because the very next morning I feel like I have to rewash or dry everything due to unwanted wrinkles or not knowing what is really clean. What a waste of time, energy, and laundry soap!! I couldn’t take it any longer. One morning, I decided I had to make a major change. I headed down to the basement and grabbed a couple old card tables and plastic tubs. I cleared out the corner of my office (which once consisted of a comfy chair and lamp) and I set the tables up. Sure, I was sad to see my “reading chair” go (which never got used—but “looked” nice!) but I knew this area could be better utilized for something more practical. 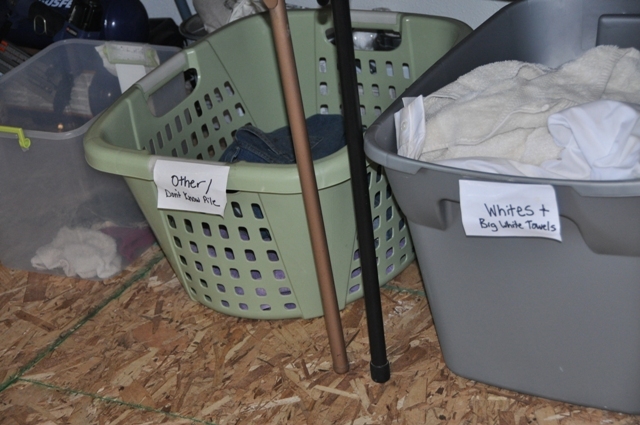 I labeled each tub “whites/colors/smelly stuff—washcloths/other” and slid them under the table. Within 15 minutes I had a functional laundry area and my life has been drastically changed every since! I now have room to fold and make piles for each person in our family. I also decided that I needed a place to hang clean clothes, so I took the hanging rod out of one of my kids’ closets and hung in above the card tables! It only took me about 10 minutes to move from their closet to the new spot, and now it saves me tons of time from walking back and forth to bedrooms to hang clothes! If I don’t get around to putting clothes away, everyone knows that their clean piles are now in my office. 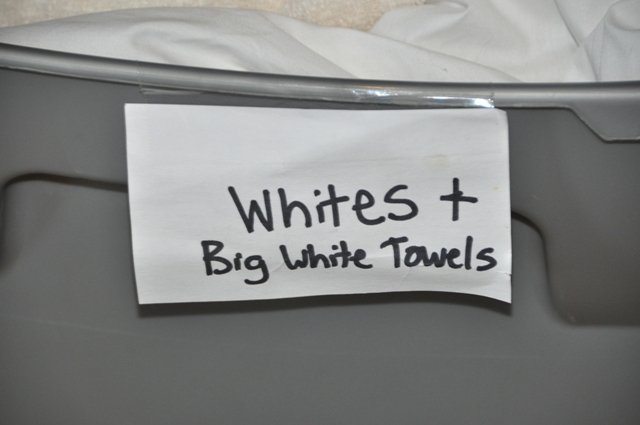 My entire family has done great making sure they put their dirty laundry in the correct tub (but I even have an “other/don’t know pile” tub in case someone gets confused!) and I am proud to say that we haven’t dealt with any onion-smelly clothes since! YAY! MISSION ACCOMPLISHED! 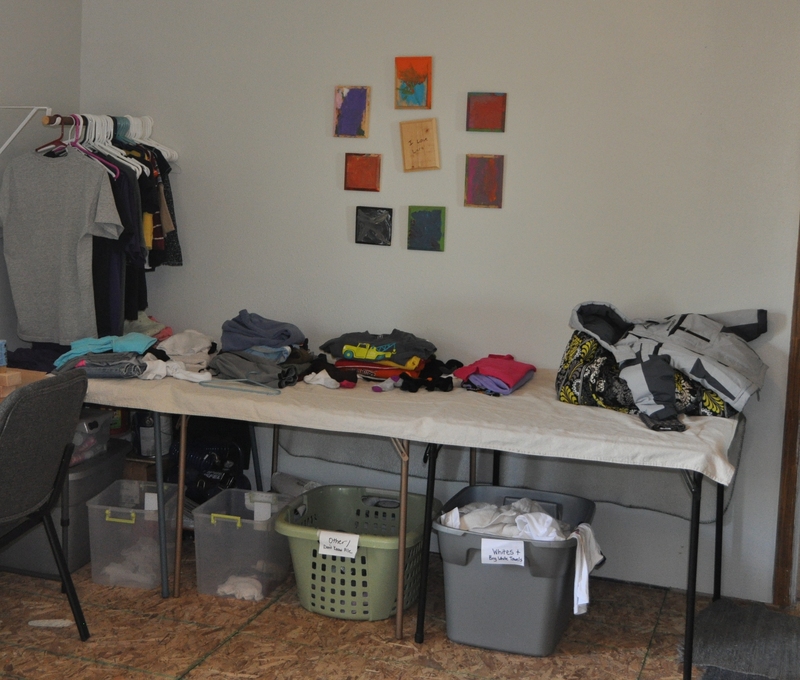 One more thing I want to add…as you can see, my laundry room does not look “pretty”. In the past I would have put off making a makeshift laundry room due to feeling like I needed custom cabinets and a reconstructed room in order to have a functional laundry space. Because I did it this way, I was able to create a better laundry situation within 15 minutes AND it will give me time to try it out before I decide when and if I should ever upgrade to something more permanent. Good “looks” don’t always mean a HaPpY HeArt! Make a change TODAY! !